Creole dances were danced by the children of Spaniards and aborigines, also called mestizos, born in Mesoamerica, who now are representative of the inhabitants of the new world. The Spanish musical culture has provided the essential foundation for musical expression among the mestizo population. This foundation has mixed with the American indigenous culture to form the creole dances. Most mestizo dance forms and their musical accompaniment carry the titles of European salon dances that took root throughout the mestizo population during the colonial and early independence periods. These dances, especially in the remote rural areas, often bear only a token similarity to their European origins. Mestizo dance music is almost uniformly in major key and tonality, 3/4 or 6/8 meter, with sectional structure.. Harmonies rarely extend beyond the compass of tonic, sub-dominant, and dominant cords. Modulation may occur between sections, with corresponding changes in meter or tempo between sections. This creole dance, originally from the municipality of Trinidad, department of Santa Bárbara, was informed by Mr. Justiniano Reyes compiled by Carlos Gómez and Rubén Ruíz. Mr. Justiniano tells us that when this dance was performed the floors of the houses of the campesinos were not not made of cement, brick nor wood, but of pure earth. Every time campesinos danced during parties, they tore the earth up in many lumps and raised dust, hence the name of the dance Arranca Terrones, or "kick up earth" in English. This dance was compiled by Wilberto Bonilla Ríos. The dance originates from the municipality of Tómala in the department of Lempira. Preliminary: This dance has not yet been officially certified by the National Office of Folklore. This dance owes its name to a Don Juan de Aririo. The dance was documented by Rafael Manzanares Aguilar in the village of Lodo Colorado, Santa Rosa de Copán. It is a piece of music played in the neighborhoods of San Salvador in times past, it was a very popular piece but over time the real name of that composition was lost, and became referred to as el barreño (the basin) from the words of the song. This dance is well known and is performed in many cultural events. It is danced with elements of feminine flirtation and masculine gallantry. que este caballito no lo monto yo. Ay! barreño dueño de mi corazón. Ay! barreño si, Ay barreño no. muchachos ya son las once. esta leche a mi me mata. This dance was researched and documented by professors Auxiliadora Narváez and Tania Pinto de Morán in the village of Cacahutare, municipality of Pespire, department of Choluteca, with the collaboration of Luis Macías and Don Tomás B. Narváez. After many years of not being danced, the dance was revived by professor Oscar Armando Guevara and professor Tania Pinto de Morán. It was informed by Doña Ubaldina Suazo de Salazar and Don Miguel Salazar. Historically, this dance was performed in all the popular festivals of the region and characteristically it was danced at midnight as a farewell dance. With it dancers symbolized the union and friendship between surrounding villages before they returned to homes in different villages. Su navegador no admite el elemento de video. This dance was recently researched and documented Wilberto Bonilla Ríos, in the village if Agua Blanca, municipality of San Miguel Guancapla, department of Intibuca. This dance was researched and documented by Rubén Ruiz. It was informed by Dr. Modesto Fajardo of Santa Rosa de Copan. The dance is originally from Dulce Nombre de Copan. The dance derived its name from the village of Cáscaras (shells), which was located in the plain of the Cáscaras. In this dance, The girls sometimes sometimes flirt with the boys by bringing their faces and bodies closer to them, but other times they show contempt and abruptly withdraw from the boys. In the end they make up and the boys tenderly kiss their partners on the cheek. It as played with accordion. In 1992 it was played at the Feria Patronal de Dulce Nombre, and danced at just about every party in that location. In times passed, it was originally called "Valle de Las Cascaras." This dance is originally from the villages of Nueva Esperanza, Chiligatoro, and Azacualpa among others, in La Esperanza, Intibucá in addition. This dance was also performed in the department of La Paz in the municipality of Marcala and its surroundings. Investigation of this dance started in 2004 and ended in the Holy Week of 2006 by Dr. Wilberto Bonilla Ríos. He initially submitted his findings about the dance to the Cuadro Nacional de Danzas Folklóricas de Honduras in 2006 while it was under the directorship of Carlos Valladares. The research was subsequently followed up and completed in 2010 by the Cuadro Nacional de Danzas Folklóricas under the directorship of Azucena Mendoza. The research was informed primarily by Mr. Avilio Flores, who was originally from the village Nueva Esperanza. He learned and performed the dance from age 9 and learned the music on guitar from Mr. Emilio Gutiérrez, and professor Jubilado Víctor Dominguez who knew some about the dance because learned it in La Esperanza Intibucá. He contributed information about the beginning of the dance as well as the step and how to hold the partner, which he learned from his father when he was small. Rafael Manzanares Aguilar who first played the music with caramba and told us how he and his father made a different version of the caramba by adding a resonating wood box at the base of the arch to amplify the sound. Rafael also helped inform this dance by playing the music on the guitar. According to the informants, this piece was well known and always danced a little late when couples start to leave a fiesta by those who knew the steps, as these and the entire dance require practice to master. The music starts slowly and the dancers are initially cautious to follow the person who starts the fun. Others then start to join the dance until everyone is dancing. Often in a chain reaction, the first dancer finds a partner, than the first two find new partners, then those four find four fresh partners, until everyone is dancing. The dance was initially danced by adults but over time it changed until it is like children's music round and is practiced in that manner. This piece had its peak in the 40s, being danced then for the last time before being rediscovered. Don Avilio fibre learned the music from Mr. Emilio Gutiérrez's recollection, and it they who interpreted the polka part of the dance, in other words, the fast part of the dance, running it on guitar as well as demonstrating the steps for the dance. The dance was usually played solo with string orchestra, and from time to time when an accordion. The dance has several holds, waltz grip, cat's nail grip. And round, in the form of dance it takes a certain swing towards the sides and a greeting inside the dance or like them. They have a come, this is to take off the hat in certain loaves of choreography as a greeting that the man does to the woman in courtesy signal at, when removing the hat the male does as a greeting with the head. The man invited the lady with a blue parabellum or red and if she accepted it I wanted to dance with her, or simply the couples that were in the stage they brought out other people to be join the dance, of course only those who could Do the step also to get one person to another in the dance there had to be trust between those people so that there would be no fights if not they just did it between friends and family and that way everyone enjoyed this dance besides, this dance is very joyful because during the dance people threw screams and cheers to which all the people shouted "Long live the compadre Ramón y la Rosa who accompanies him referring to him and his wife and occasionally coplas or. The origin of the name of the dance is unknown, possibly referring to the name for which it was made, for a woman whose name was Maria Jesus or Chunga. Another version is that this woman liked this dance and that's why they said the Chunga dance in diminutive. This is embodied in a rural legend that a very popular and animated girl in one of the villages named Maria Jesús liked to demonstrate the dance steps and how to hold one's partner for this dance, so everyone followed her lead. It is said that she always asked musicians to play La Chunga. If she was busy in the kitchen and heard the music, she would stop whatever she was doing and begin dancing. If there was no one who wanted to dance with her when this happened, she would grab a broom as a partner, which made everyone laugh. The dance is said to have lyrics but unfortunately these were already been lost when the dance was researched and there were no people who remembered them. So we only have the instrumental the melody instrumental. Informants remembered the phrase "Chunga over here, Chunga over there, Chunga in front, and Chunga in back!" which is sung at the end of each musical phrase of the polkas. This dance is reminiscent of times when dancers were forbidden to talk during dancing, and if they did the girls left the dance. In these circumstances the dancers resorted to passing little letters that were written on the leg. In the dance men pull off their belts and disguised their intentions with a series of movements and formations made with the belt, expressing anger and threat, until they understood their partners' intent. From these movements is where the name comes. Documented by David Flores and Luis Gustavo Catellón, in the village of El Tunal, municipality of San Esteban, Olancho, on April 7, 1993. It was informed by the profesor Calixto de Jesus Velásquez native of that village, with music documented by Roger Antúnez and Jorege Alberto Munguía (QDDG) residents of San Esteban, the latter was processed by the musicians of the Cuadro Nacional de Danzas Folklóricas de Honduras. Chapias refers to the abrupt movement of the feet when brushing the floor, similar to the movement carried out by the peasants when chapping the land for cultivation. The informant, Mr. Calixto reported that this dance was very common at fiestas and birthdays and especially at weekends in communities near the village, especially in the village of Conce. He related that when he was very you that he liked to walk to the parties to learn to dance. That the children like to dance with Mrs. María Valásquez Padrilla and that they received 25 or 50 centavos each time that the danced, which in that time was a lot of money. People called attention despite his young age to to his agility. This dance originates from the municipality of Yoro, department of Yoro. The dance was documented by Rubén Ruíz and informed by Mrs. María Orfelia Reyes and professor Modesto Rodas Ramírez. This musical piece is inspired by the traditional dance that the Yoreños make every year on the day of their patron saint, on July 15 in the meeting room of the municipal council. According to informants the dance had the virtue of uniting all social classes that at that time were separated. The name Cututeo comes from the sound produced by the drums during the dance. This dance was researched and documented by professor David Adolfo Lía Cuello Danza en the municipality of Esteban, Las Limas and La Venta of the municipality of of Guanaco, July 12, 1991. It was informed by Miguel Ángel Pacheco Martines, the music and steps by Mrs. señora María de Carmen Díaz. It is derived from the great dances played by Joan Strauss, European roots influence. Our campesinos try to imitate such dances and when they played the music they said to play a Strauss. This dance was very popular in the village Mico and El Aguacate at Christmas and on January 6 and every Saturday when the young people gathered to dance, the parties could start the party. To dance was performed with the accordion, guitar. Dance originally from the Municipality of San Esteban, Olancho. This mestizo dance of creole origin was researched and documented in the village of Las Flores and La Jagua in the municipality of San Esteban, department of Olancho on December 8, 2005, by professor Luis Gustavo Castellón in collaboration with Leny Padilla, Juan Pablo Valladares and José Ramón Borjas. The dance was informed by Mr. José Ramón Ordóñez and Mrs. Clilofe Hernández. The music was played by Mr. Miguel Veliz from the accordionist village of Las Vargas and by guitarist Heligton Alexer Antunes. This dance was performed a lot during the Christmas season and especially for the Day of Kings, when it is customary to rob the child. Don Ramón tells us that previously the parties were quiet and honest, and that during the dance was a Exchange of couples. The rhythm of this dance resembles the great right-handed strides with staggered steps. They say that at parties it used to be said: "Touch again the trash can! Long live the wreck! Or to dance the wreck! This dance is originally from the municipality of Duyure in the department of Choluteca. It was informed by Daniel Bustillo and was investigated and documented by professor Oscar Armando Guevara with the collaboration of the teachers Rosa Argentina Rueda and Daniela de Bustillo. This dance was performed in patron saint festivities and on special occasions like baptisms and weddings. Dance compiled by David Adolfo Flores Valladares in the village of El Barrero, El Barranca hamlet, in the Municipality of San Esteben, department of Olancho. This dance was danced in Olancho. Doña Teresa de Jesús Posantes was the informant for this dance, which was compiled in the hamlet of Casas Viejas in the municipality of Guanaca, Department of Olancho, on July 12, 1991 by Professor David Adolfo Flores in collaboration Prof. Luís Gustavo Castellón and Erika Cecilia Cuellar, this dance was researched and documented to the National Department of Folklore by prof. David Flores, and music by the marimba of the Cuadro Nacional de Danzas Folklóricas de Honduras. El Esquipuleño was danced at parties of the region, including marriages, Christmas, especially when the Saint of Esquipulenas of Santa Maria del Carbón was brought, hence the name of this dance is derived. The favorite musician to play this piece is Ignacio Borjas Mejia, the original music was performed by José Antonio Zunuga Posantes, the costumes were woman in white dress, the man in blue or black pants and a white shirt. Researched and documented by Wilberto Bonilla Ríos in the village of Agua Blanca, municipality of San Miguel Guancapla, department of Intibucá. This striking and unusual dance was danced up until 1960. Oro Lenca has added it to their reportoire. You can find it at 18:51 in their performance at Gracias Lempira in 2014. This is a popular mestizo party dance. It is a very cheerful and lively dance that was danced after the corn harvest. Days after the harvest, villagers prepared a feast to celebrate the successful harvest. The villagers cleared a stubble from a swath of the corn field in which to celebrate. As the dance was very lively and adventuresome in a roguish fashion, they danced it repeatedly. It was danced in the same location in succeeding years, and as the dance had no name, it became known as Frente a la Guatalera (la que no tiene nombre). In "front of the guatalera" (guatalera referred to the peasant musicians of the southern region of Honduras), and the the remainder of the the translation is "the piece that has no name". It was compiled and researched by Professor Oscar Armando Guevara with the collaboration of Reverend Jesus Valladares and informed by Mr. Santos Seferino Ordóñes on September 24, 1993. This creole danza is a polka from Catacamas in the department of Olancho, documented relatively recently by Everth Zelaya. 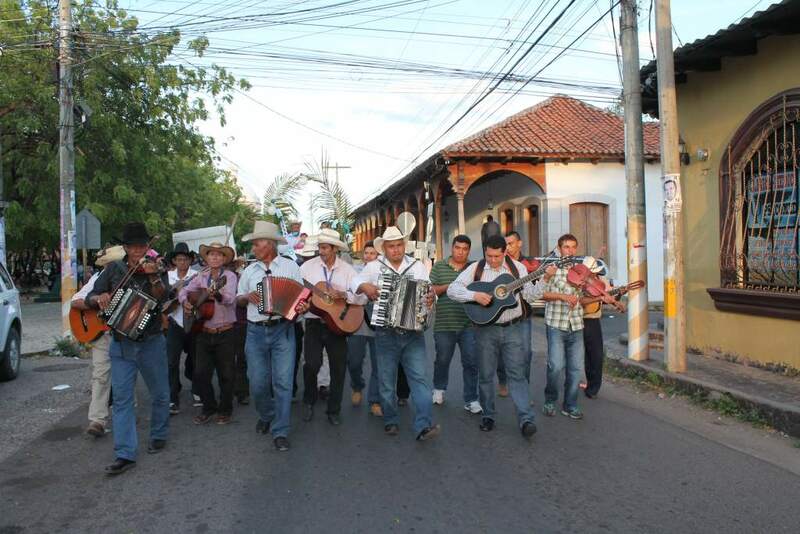 The Guapango is a very common musical rhythm in the southern part of Honduras. This dance was compiled in one of the villages of Chilcas, Municipality of Orocuina, department of Choluteca, by Rafael Flores. It owes its name to the place of origin. The Guapango is a very common musical rhythm in the southern part of Honduras. This dance was compiled in one of the villages of Linaca, department of Choluteca, by Rafael Manzanares Aguilar and was informed by the Trío Los Caracoles. To this situation and the place where it was collected, it owes its name. This was a very happy dance for parties. It is danced with 6 couples although you can dance with more except when when dancing in a competition. Couples start first all in a single row, and then separate into 2 offset horizontal rows. The man and the woman rotate in a circular way around an axis of the pair, with the woman first holding the man's hat outstretched in front of her, and then dropping it, so that the rotation turns around the man's hat on the floor, then he picks up the hat and the pairs fall in on their partners flirting and falling in love, and finally all of the couples rotate around the dance floor. This dance was informed by Mr. Amado de Jesús Varela and compiled by Tania Pinto de Morán in the hamlet of Jocomico, Choluteca. It is a very common dance in the south of the country and owes its name to a community that is close to the river near Choluteca. The rithym of this dance is enjoyed by the farmes in the village of Jutikile, department of Olancho. The dance was compiled by Rafael Manzanares Aguilar. This creole dance is originally from the department of Yoro, municipality of Yoro, village los Lirios, hence the name of the dance, Los Lirioso Danzón. This piece was performed with accordion, timbales and guitarrapor in the 1930s and 1940s. It was very popular in that region mainly because of the young people who who partied. It was danced outdoors, that is, in a corridor or a large area, since the dancers liked to demonstrate their artistic abilities. It was traditional for men to invite women first to dance El Danzón, and as a sample they offered a handkerchief to the women in respect and chivalry. The men said almost to one voice "We dance the danzón (Bailemos el danzón)". A special feature of the dance is that women wear different colored flowers on their heads, flowered blouses with lace and multi-colored skirts, men wore their dark trousers with white shirts. The peculiarity of danzón or Los Lirios is the corporal expression of the dancers, mainly the one of the woman by their grace and elegant movement of dancing, particularly the movement of tjeor waists. Informed by Moisés Castillo, who was 73 years old at the time. The dance was performed by his son Moisés Castillo Miranda, acompanied by Mr. José Madrid, with accordion, timbales y zambumbua (stringed instruments). Compiled by professor Diógenes Orlando Álvarez Rodas and Nectalí Cáceres in 1997, incorporated into the National Office Folklore Nacional on 14 July 2000, under direction of the Cuadro Nacional de Danzas Folklóricas de Honduras and the president of AIDAFH, businessman Carlos Raúl Valladeres. It was initially performed in public by dancers of the Instituto Oficial Manuel Bonilla of the city of La Ceiba. This dance was compiled on December 29, 2004, by Dr. Wilberto Bonilla Ríos, and informed by Mr. José Amparo Melgar. The dance is from the municipality of La Esperanza, Intibucá. The Macheteado Musical owes its name not because it includes machetes but to the way in which the music was distributed, chopped up by a machete, so to speak, so that the same melody assumes several rhythms, as requested by the dancers. At the end of each rhythm the music stops and changes to another rhythm, but the melody remains the same. The informant, Mr. José Amparo, observed that the melody has incorporated traditional music for popular Mexican songs, but some still play the original melodies that have Spanish influence. You can appreciate this in the rhythms of double, corrido, waltz and polka. This creole dance was danced on special occasions on a farm called Palito Verde (Little Green Tree), located in Trinidad, Department of Santa Bárbara, which accounts for its name. At the time that this dance was compiled, the farm was was owned by José María Herrera Regalado. This dance starts with six couples arranged in a circle. three of the couples form a triangle and rotate within the circle still formed by the other three couples, one couple gyrating at each vertice of the triangle. The three couples in the triangle then return to the outer circle and the other three couples form the triangle that rotates within the circle. The couples then rotate into a distinctive stationary line dance in which the men hold their hats lean into, held by their partners. The six couples then return to the circle except that the three couples that initially rotated as the inner triad initially form the outer circle. After repeating the two triangles, the couples snake through a semicircle into a "V" in which they perform the stationary steps while the "V" forms into a line and then into an inverted "V" in which the couples complete the dance. The dance was informed by Don Justiniano Reyes and the primary education teacher Rosa Ana Fernández. It was compiled by Carlos Gómez and Rubén Ruiz, both from the National Office of Folklore. Researched and documented by Wilberto Bonilla Ríos in the village of Agua Blanca, municipality of San Miguel Guancapla, department of Intibucá. This dance starts with a haunting melody in a circle like the traditional version except that three of the dancers gyrate into an inner triangle and return to the outer circle without rotating inside the outer circle. This is followed by jigs, rocking steps and flourishes through various linear configurations, without the characteristic stationary steps of the traditional form, to end in the "V" formation. Watch Video Published by Zully Mariela Alvarenga Santos on Jul 12, 2013. This is a mestizo dance with indigenous influence. It was compiled in 2012 by Wilberto Bonilla Ríos and Marcio Suazo Izaguirre in the municipality of Marcala, department of La Paz, and informed by Don Leonidas Trejo. The name of the dance refers to the comb (peineta) that the young men put in the hair of the young women. This is a dance that was danced on special occasions such as: the delivery of children that occurred on the dates of December 4 to 8, also in the patron saint's festivities, weddings, baptisms, birthdays, halls and halls, etc. being the first dance with which all these parties began. This dance was informed by Concepción Tróchez Pineda and compiled by Professor David Adolfo Flores Valladares and Antonio Bonilla with the collaboration of Professor Raúl Alvarado, Justiniano Reyes and Walter Troches. This dance is originally from the Department of Santa Barbara, Village El Ocotillo in the municipality of La Aranda as well as surrounding villages. This creole dance was compiled in Ramón Arriba by Tania Pinto Ramos de Morán in March of 1983 and incorporated into the National Office of Folklore office by Professor David Adolfo Flores. The dance originates from the hamlet of Linaca belonging to the village of San Ramón, in the department of Cholutec. The informant was don Concepción Corrales, born in 1904 and a resident of Linaca. The dance was performed around 1916 in the farmhouse of Las Uvas. It was danced exclusively by young people belonging to the same hamlet. During the dance the military influence of the time is reflected, caused by the presence of a cantonal corporal who came to the village and walked and danced martially. Dancers occasionally wore military uniforms, also reflected in the uniformity of the costumes of the ladies, as well as the elegance and gallantry of the men. This creole dance was danced in dance halls. It is originally from the village La Enea, municipality of Morolica, department of Choluteca. With this dance the festivities began in honor of the Patron Saint of San José, and this musical piece was danced only by the mayordomos and capitanas of the patron saint. The dance was informed by Mr. Víctor Moncada and his wife Raymunda Martínez and compiled by Oscar Guevara. 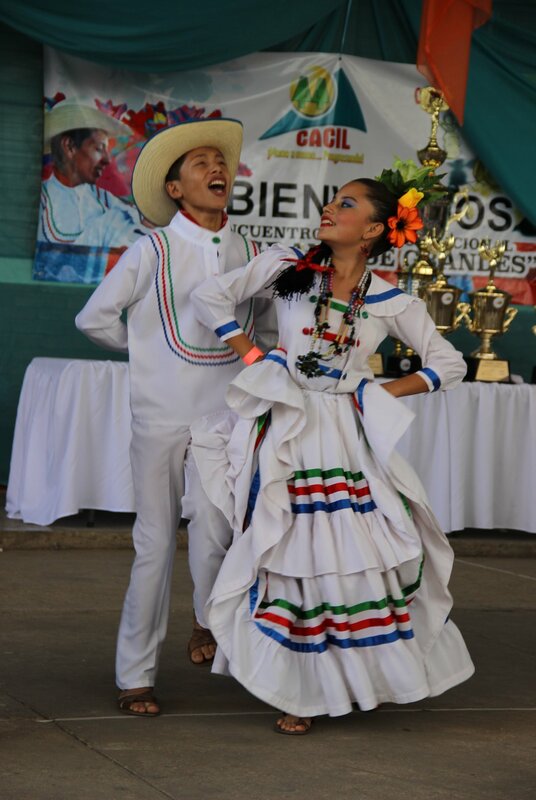 This dance is from the village La Enea, in Morolica, in the department of Choluteca. It was danced at the parties of the Patron Saint of San José. Its name is due to the fact that a young woman, despite her beauty, was despised by her lover; to forget this contempt she started dancing with one of the butlers, and when he saw her cry, he lent her his handkerchief to dry his tears. The dance was informed by Ramón Moncada and his wife Raymunda Martínez and compiled by Oscar Guevara. This dance dates back to the beginning of the 1900's century, and was commonly performed by younger people because it is very cheerful. Its name is because there was a place near the village called Las Manguitas, where there were mango trees and lovers used to meet secretly to avoid their parents. After couples were married couples asked, they would touch the polka sleeves remembering this place. According to the informant this piece varied in choreography, according to what the dancers wanted, but almost always the figure of a row was maintained. This dance was compiled by Dr. Wilberto Bonilla, in La Esperanza, Intibucá, on December 28, 2004, and informed by Don Avilio Flores Pineda. The music was played with the stringed instruments (guitar, double bass, violin) that were the most common in the area. This dance is originally from the village of Las Quebradas, municipality of Talanga, department of Francisco Morazán. The name of the dance is described by the following story. "They say that in the popular festivities of the village, which were held in the homes of the popular sisters Petrona and Marcelina Valladares, because these were the largest houses in the community. There was a young lady called María Luisa Coello who liked to play the polka on guitar, so everyone danced Maria Luisa's polka. The dance was informed by Mrs. Pascuala Zúniga Valladares and Professor Herlinda Flores, and compiled by Ramón Fúnez in collaboration with Alba Hernández and Leonor Galeano. This dance was compiled in the municipality of San Esteben, villages of Las Limas and La Venta, in the municipality of Guanaco in the department of Olancho on June 12, 1991, by Professor David Adolfo Flores in collaboration with Professor Luís Castellón and Erica Cecilia Cuellar, informed by Miguel Ángel Pacheco Martínez, and the music and steps by Mrs. Maria del Carmen Díaz. La Polca Marcada was danced a lot around Christmas, especially after Christmas on January 6. It was also danced every Saturday, when all the young people gathered for the weekend fiestas. The mayor had to work so that the festivals did not get out of hand, he confined or fined the drunks, and restrain the lovers. Instruments used for this dance were accordion, guitar and mandolin. During investigation of the dance, the music was performed on accordion by Mr Miguel Ángel Pacheco. The peculiar thing about this dance was that the youngsters and the old people from the villages had a lot of fun because of the theft of couples, and the mockery that others made of the dancer or dancers left without partners, humorously referred to as "motorcycles (el moto o los motos)". A dancer in that case had to find a partner or otherwise had to give a pledge and perform a penance at the end of the dance. In the midst of dancing, it used to be said, "You ate and you killed the goat and you did not give me a chicharrón (Te comiste y te mataste la chiva y no me diste ni un chicharrón)," and the girls were told, "Live so-and-so, I'm dying at her feet (Que viva fulana, que muero a los pies de ella)". When the dance ended, everyone said, "El moto, el moto, el moto!" or "El moto, el moto, que viva el moto!". Folk dance of creole roots, with dancing in couples. It begins in a circle characteristic of most of the dances of southern Honduras. Traditionally this dance was staged when the family and parents realized that their girls had boyfriends or suitors. The parents of all the girls who had boyfriends or suitors met and agreed to have a party for which they invited the boyfriends or suitors to that party. This allowed the couples to decide that they really liked each other and if not provide opportunity for a young man to win another girl's heart. The boys wore a flower or engagement ring, and if a girl did not reject it she would wear it as a commitment or oath to get married. When a girl so committed to marry they would agree then on a wedding date. Hence the name of the dance, which translates to "The Polka of the Bride." The dance was compiled by professor Oscar Armando Molina, in the village of El Espinal, in the municipality of Pespire, departament of Choluteca. It was informed by Mr. Anastasio Molina on October 11, 1996. The Polka Picada is a mestizo dance with indigenous influence. By its form and way of dance it is a collective dance of couples. It was collected in El Coyolar hamlet, El Pidrero village, municipality of San Esteban, in the department of Olancho, on February 2, 2008 by Professor Luis Gustavo Castellón Ochoa in collaboration with Zoila Nohemí Parrales and Juan Pablo Valladares. It was informed by María Sofía Rivera Mejía, who was born on October 8, 1929. The brothers Gregorio Ramiro Veliz and Julio Santiago Veliz from Los Naranjos village executed it. According to the informant Mrs. Sofía for this piece of music, it was customary to dance on the day of September 15 (Honduran Independence day) and for the day of the Saint of Esquipulas of Santa María del Carbon. Before dancing, the dancers say, "Campo para Bailar Polca Picada". The dance is recognizable by the musical riff that call dancers to prepare to dance. This dance was one of the dances, along with the La Estaca dance, that were danced in the coal region to which it is similar in execution of the dance steps. Initially this was a dance of the Pech indigenous group (one of the indigenous people that inhabited territory within what is now called Honduras for many years). It ceased to be danced by this ethnic group, but it was preserved by the Ladino people of the region, as they have appropriated and performed it as their own. This dance was presented for the first time after being added to the national folklore archives by the folk group "Agalta" in the celebration of the first Mass of Fray Martin at the San Esteban Institute on December 26, 2009. 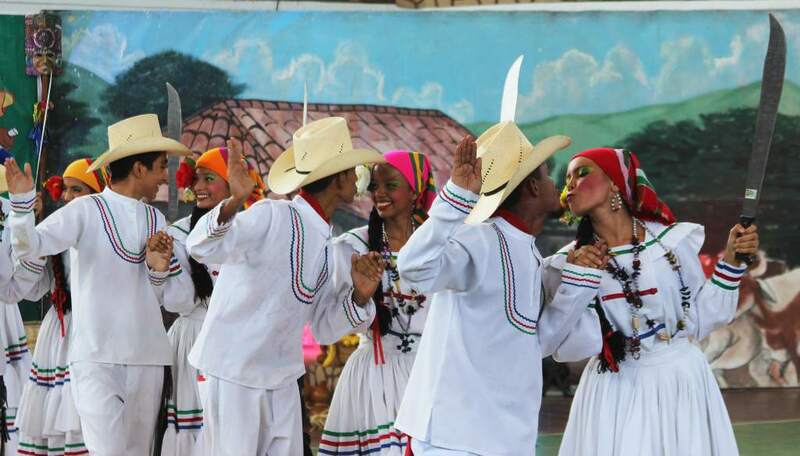 This mestizo dance designated of creole origin was compiled in the municipality of San Esteban, Olancho on October 27, 2005 by Prof. Luis Gustavo Castellón, in collaboration with Leny Padilla and Juan Pablo Valladares. It was informed by Mr. Pablo Amilcar Sarmiento. The story of this dance begins in the hamlet of Los Ángeles, in the house of Mr. Prospero Castillo, a naturist doctor familiarly known as Don Popo. This dance is similar to the dance of El Borrachito or La Escoba, where one of the dancers is left alone, humorously referred to as "the motorcycle (el moto)," who enters to dance with a plate. In certain parts of the dance el moto places the plate so that another will stumble over it and let go of his partner to pick up the plate. At this time they changed partners and el moto thereby finds a partner leaving the other dancer with the plate. At other times el moto would spin the plate in the center of the room and point out a couple or say a number so that the man would have to release his partner and rush to reach the plate while it was still spinning. If he failed to do so, he had to perform a penance as well as lose his partner and become el moto, and the dancer who spun the plate would thereby get a partner. This popular mestizo dance is danced with a group of partners. After the carrera de cintas (a traditional sport often played during the feria patronal) in Jocomico, Palo Herrado, Copal, Santa Elena and other surrounding villages in the department of Choluteca, it was customary to hold a party in honor of the godmothers. Rosa was a very graceful and industrious young woman, and for these reasons she was always looked for as the godmother of the carrera de cintas. Pancho Amador was a strong man, a good dancer who liked Rosa a lot, that's why when the party started he would shout, "Musicians, a polka to dance with Rosa Maistro toque una polca para bailar con Rosa". Hence the dance assume the name of Rosa's Polca (Polca de la Rosa). The musical piece was informed by the dancer Rosa Osorto (R.I.P.) and the musician Amado de Jesús Varela, in August of 1974 and recovered on September 10, 1985 in La Cuesta La Julia or Jocomico, Choluteca. (Another account says that the dance was recovered in the hamlet of El Copal Abajo, in the municipality of Choluteca, departamento de Choluteca, and informed by Amado Varela in September 1977.) It was compiled by Tania Pinto Ramos de Morán, accompanied by her children José Armando, María del Pilar and Roberto Antonio Morán. Dance that was danced during the celebration of the patron fair of the village of San Juan Bautista in the municipality of Pespire, department of Choluteca. The name of the dance is described by the following story: "They say that in the village square, there was a lady called Arcadia. When Ramirez sold cigars "La Vieja", when a man called Ignacio Perdomo called Nacho, when he saw him, Dona Arcadia said to him "Hey, Nacho, take me to the fair to give me a sanjuaneada and in exchange I'll give you a little cigar. so Nacho took her to sanjuanear. The dance was informed by Professor Tomás V. Narváez and compiled by Tania Pinto de Morán. This creole dance was danced in colonial times. This dance was compiled by professor David Adolfo Flores Valladares, in collaboration with professor María del Carmen Contreras on March 27, 1992 in the city of Progreso, Department of Yoro. It was informed by professor Raúl Castellanos. Professor Castellanos described how this dance was danced on special occasions and festivals in the region of Ceguaca, department of Santa Bárbara and surrounding villages. The grandfather of prof. Castellanos, Justiniano Castellanos and his brother Rosénilo Castellanos initiated the revival of this dance in 1835. Initially it was played in guitar and violin and later with concertina and marimba. The brothers played the music in all the fiestas with violin, accordion and guitar, for that reason they called it "Las Raíces de Los Castellanos". Following the tradition Mr. Raúl Castellanos played the dance in the company of his son Justiniano Castellanos who executed the guitar. In those times people charged the amount of two cents or chips, for that reason people began to say Toquen Corrido of the fichas of the fichas. Professor Castellanos was also was part of a group of musicians with Mr. Jesus Mejia Rodriguez of that Municipality playing the contrabass. In 1965, when the mayor of Ceguaca took office, they were hired to liven up the party where this dance was the first dance that was danced. La Rana is a group dance for couples. This dance is originally from the town of Linaca, municipality of Chuleteca, department of Chuleteca, and compiled by Ricardo Rodriguez. Its name originates from an abundance of frogs in the gullies and streams of the region and for the form in which the dancers jump and hop like frogs. The dance is performed at fairs (festivales patronales), marriages, and baptisms. This dance assumes its name due to a succession of different rythms that follow one another during the dance: polkas, minuets, zapateados, etc. The dance was informed by the Trío los Caracoles and compiled by Rafael Manzanares Aguilar in the town of Linaca, departament of Choluteca. It originated in the village of San Martín, Choluteca. The name of this dance derives from how easy it is to execute and dance, "as easy as sighing." The dance was informed by Mrs. María del Carmen Díaz, resident of the village of Las Limas, born in the hamlet of Tonjagua, municipality of San Esteban, department of Olancho. Compiled by professors David Flores and Gustavo Castellón, the music was performed by Mr. Miguel Pacheco. This creole dance originated from the village La Galera, municipality of Corpus, Choluteca department. It was informed by Mr. José Ismael Mondragon who is a musician that also played the piece. The peculiarity of this dance was that at parties when the drunken guests remaining after the party heard the music, they began to wake up and perform jocular movements, always according to what the dance was. On the other hand, the gallants when they saw a girl they liked, asked the musicians to play the song up to five times to engage with her. The informant tells us that this dance was danced approximately 300 years ago. It was danced with arrangements for the first time by the regional group Proyeccion Folklorica Huntulha. This dance was compiled by the Marvin Moreno and Jairo Exau Alvarez, in the company of the Thania Pinto de Moran, on December 9, 1999, and was incorporated into the National Office of Folklore on April 1, 2000. The informant of this piece for both dance and music was Mr. Avilio Flores originally from the village of Nueva Esperanza but resident in Esperanza Intibucá at the time. He said that this dance was performed for all types of village parties including birthdays, Day of the Patron Saint, or at any popular party. Another individual who made a special contribution in documenting this dance was was Professor Víctor David Dominguez who provided the opening melody of dance where the couples were to go out to dance and where the man did he was coming (a greeting of courtesy and respect) to the dancing couple like the other people who were at the party mainly if the person was coming to the party, this was done with a happy music in where the musicians sang a melody, "Adentro palito verde, adentro, que están vailando»". The dance choreographically according to Don Avilio He always danced in groups of 3 couples and stressed that the place should be wide so that the dance had structure since according to the informant the couples were always always well aligned and between the dance, the boys made their way to the girl, in all the dance the couples go aligned in groups of three couples this was due to that the rooms were not very big or they were rectangular and not to trip were organized that form during the dance both the male and the woman they make a greeting or as they do Haman «La venia» which is a greeting where both approach and almost hit cheek to cheek, and the other greeting is the from the entrance of the dance where the dancers males take off their hats briefly and greet the girls crouching a little to the head and just like the women who are at the party to to be able to get a couple, that girl who want to dance with him will follow him to form a row knowing already that He will be your dancing partner. This dance contains as a step a sliding xique and the music a waltz rhythm so it's called waltz but I doubt it's because of the composer Austrian Strauss, because they handle it like a musical rhythm where it's a mix between a waltz and a guapango talking about the way this made music, not as a degeneration of name of the composer you come. Don Avilio learned the dance to see his mother Dona Otilia Pineda and dona Francisca Villanueva, sister of don Pedro Villanueva, Don Carlos Tinoco that in the years forty He was already 45 years old and Don Leonidas Aguilar were the musicians who were starting to execute music, which started from 7 or 8 of the night which people asked for a lot for being a melody well sticky and romantic and where there was a lot of live joy and other screams like being («Viva Pedro Villanueva! "And everyone answered" Long live! ") Or if they did not say (" May the elders of the town live! "To which everyone said" May they live! ") This was so that the party would be pleasant and as Don Avilio Flores says with the drinks over was more cheerful between smiles. He also says that in this dance you could dance necessarily the boyfriend with the girlfriend or the wife with the husband because there was a lot of respect between the people from that place and they did it naturally and nobody was jealous for it because the family almost all of them were related and where It was also danced between members of the same family as brothers or uncles etc., this dance almost he was danced in the nineteen forties like the dance of Chunga leaving to dance in the fifties. The music was played as is common in that area as string and accordion instruments, and the The clothes they wore were long suits with designs by Azacualpa, Chiligatoro and other costumes those villages that had in those times these were well colorful and quite wide and with enough pleats only that the majority at that time costumes They were white in color, both male and female. In the woman was a comb on his head that could be different color according to your state marital. If it was yellow it was that he was rejecting her groom cleans as they say he was giving the cut, If it was red, I was committed to marriage and if it was white is that she was single and looked for suitor, the comb also was accompanied by a jasmine this was used because the jasmine gives a very pleasant and penetrating smell and it was used instead of perfume and also to decorate his head. The man dressed in white with two sash a black fajon where he carried the machete and a belt for the pants, also wore a handkerchief blue or red on your neck and a white one to offer it to the dancing girl. Don Avilio learned the music of Mr. Carlos Tinoco and says he played it before listening to her from her parents and her parents' friends so it goes back to the late 1800's. When Don Avilio heard her for the first time was 9 years old which he learned by ear, and the music of the corrido At the beginning of the music was provided by an aunt of Professor Víctor. This dance was well organized only those people who knew could dance the step and the movements and it was usually danced by older people since they knew the steps and the movements of the dance. Popular mestizo dance with indigenous influence, due to its shape and mode of dance, is a collective dance in loose pairs. In relation to music it is a mixed dance, since it is danced. The music was informed in the municipality of San Esteban, Olancho, by the musicians Julio Santiago Veliz and Gregorio Ramiro Veliz. This piece was also known by the name of La Ensalada. The research was conducted in the hamlet of Coyolar part of a joint research of the professors Luis Gustavo Castellón and David Flores. The choreographic part was informed by: Sofia Rivera from the hamlet of Coyolar. According to Sofía, the musical piece of Polka Volada was named that way because when the girls spread their dresses and made their turns, they seemed to be flying. At the beginning of the piece of music, a couple loudly announced "¡”"Salón libre (Free dance floor)"! Then the couples enter the room walking and talking, the woman wears a scarf, the man takes her by the waist with the right hand carrying a red handkerchief, this musical piece was danced especially for the 15 September and patron saint dates, the instruments they used were: accordion, guitar and dulzaina. It was compiled on April 9, 2008 by Professor Luis Gustavo Castellón Ochoa and was danced for the first time by the folkloric group of the Instituto Polivalentesan Esteban, in the first mass officiated by Fray Martin on December 26, 2009 in the municipality of San Esteban. Watch Video Instituto Jesus Aguilar Paz de Tegucigalpa en el XIV concurso nacional de danzas folkloricas. This dance was researched and documented by Allan Castro in the municipality of Opatoro, department of La Paz. This mestizo dance was danced to the end of the decade of 1930. The Honduran machete dance, based on the music and culture of the country. The dance is originally from the village of San Martín in the department of Choluteca. The dance was informed by the trio "Los Caracoles" of Linaca, department of Choluteca and compiled by the Honduran folklorist Rafael Manzanares Aguilar in the town of Linaca, Choluteca. This dance was performed in the village of San Martín, which is an old mining center. In this dance the men first show off their dancing skills, stomping with agility and speed before dueling with machetes. This dance is a demonstration of the manhood of the peasants, although in this delightful Honduran version of the machete dance, the men confront and duel each other but are eventually pacified by their partners. The dance finishes with the women in possession of both the machetes and their men. The women gain possession of both the machetes and their men in El Gran Pereke 2015. From La Prensa , 3 October 2015: "Mas de 60 cuadros de danza le dieron el toque al gran pereke"
This dance originated in the municipality of San Juan in the department of La Paz. The dance was performed frequently there, but also in surrounding municipalities including San Antonio Del Norte, Aguanqueterique; Caridad Valle, and Lamani. The inhabitants of San Juan knew the dance El Zapateado, but as there were other dances with that name, Paceño was appended to the name so that it could be distinguished by residents of the many municipalities of the department Of La Paz that performed this dance. This dance was researched and documented in the municipality of San Juan by Dr. Wilberto Bonilla Ríos in the years 2008 to 2010. His informants for this dance were Doña Prudenciana Ríos and Maria Antonia Almendarez, who were respectively 90 and 85 years old at the time. The dance was performed frequently since the late 1800s and early 1900s. It was danced mainly for January 14 which is the day of Saint San Juan, who is the patron saint of the municipality, and also at weddings. It was also danced on June 24, the day of the carreras de cintas, in which the winner of the races, danced with the coronation queen in the town hall. The carrera de cintas, or belt race, is a traditional race on horse or bicycle often staged during the feria patronal in Spain and Latin America. This dance is of mestizo origin with republican influence by what can be recognized as Creole, since the steps and moves are similar to European and Mexican steps, with some indigenous influence. The original music was played in mandolin, guitar, accordion, caramba and violin. In the 1950s the marimba and then wind band accompaniment. These last two came with radio and recordings, so not as might have been found in traditional settings. The dance acquired the name zapateado (which means to tab dance) because the steps are tapped, some more than others. Wealthier men liked to dance with spurs on the shoes to add the ringing sound when they stepped. The women liked to show off their best costumes and tried to turn alot to spread the dresses and shown off in that way. For the men, the dance is performed with military posture, which may have been due to the influx of mounted police in that time. One of the informants said that her great grandmother liked the dance because part of the choreography is galloping, and when there were more women at parties then men, the women danced between the men, from corner to corner of the hall, causing all to give way before them. The men on the other hand competed to show off their best steps. Pine sprigs were placed on the earthen floors to perfume the ballroom, and the floors were deformed by the steps of the dancers. The ballroom was lit with candles or wood fires outside, as there was no electric lighting at the time. This dance is very complex. It is danced in squared and circled rows, with dancers moving from corners to corners. As it is a rather agitated dance it was typically only danced by the most coordinated dancers. The origin of the dance music is not known since. The music is very simple making repetitions of a same chord for many minutes, similar to La Correa, in which the music was not well stylized but very cheerful, which was what the dancers cared for in that time. They typically danced this piece of 4 to 6 minutes, or until the dancers tired, and then they would dance a waltz a colonial dance to rest after a good Zapateado. This mestizo dance was popular at parties. The dance originated in the village of La Picota, municipality of Choluteca, department of Choluteca. The dance was researched and documented by professors Ricardo Felipe Rodríguez and Sara Emilia Mendoza de Ordóñez in August 1995. Their research was informed by Mr. Julio Rodríguez Lazo in the village of Pavana, also in the municipality of Choluteca. The movements of the dance imitate the shaking of the zaranda, a sieve-like tool utilized by campesinos to separate straw or grains from undesired materials. It is a gentle polka that was danced especially at fairs and festive parties. Like many dances of the southern region of the country dancers attired in their best Sunday clothes to perform this dance.